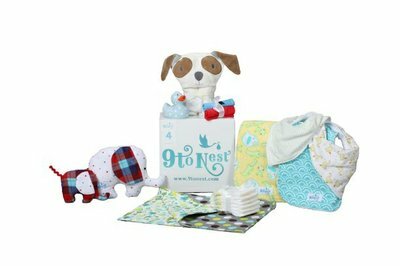 Enter your email address below to receive a notification when 9 to Nest starts accepting new sign-ups! Enter your email address below to receive a notification when 9 to Nest is accepting new sign-ups again. 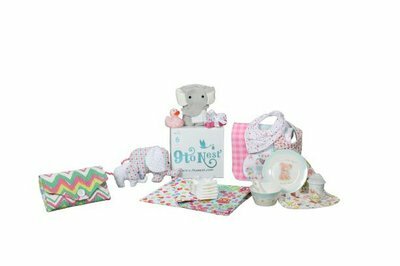 Lovely baby gifts which help countdown the months of pregnancy. 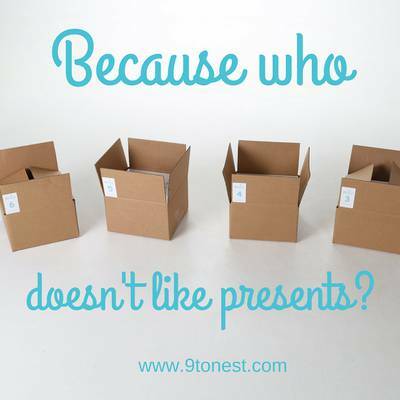 Your gift box will be shipped on or around the 15th of each month with FREE SHIPPING! Shower her with gifts before the stork's arrival! 9 to Nest is a hassle-free way of sharing in the excitement of a new arrival with expectant parents. 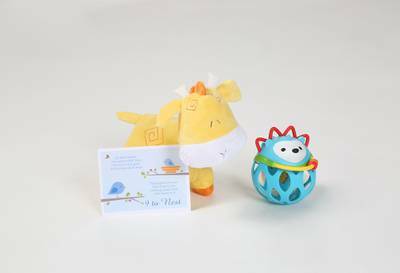 The months will pass quickly with each delivery of lovely and useful items for baby. Gifts are delivered in a beautifully packed box and are accompanied with an entertaining poem that will countdown each month until that much anticipated arrival. 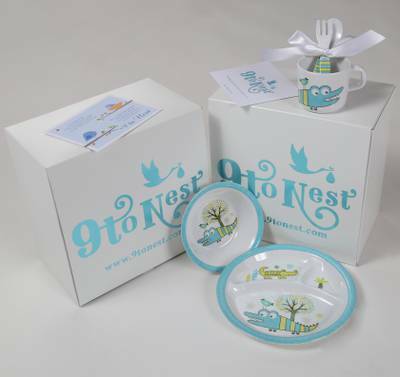 Thank you "9 to Nest" for surprising my Daughter-in-Law and Son through their pregnancy with your amazing gifts! A "second child" doesn't get quite the attention and I wanted their "Nesting Time" for Sullivan to be a little unique and "9 to Nest" fulfilled the goal! The gifts were unique and of highest quality. My husband and I found out that we are having a boy! I’ve enjoyed my first two boxes so far but I’d like to have the rest of the boxes with male specific things for the rest of my pregnancy. I tried to send a message through Crate Joy but the message wouldn’t go through! 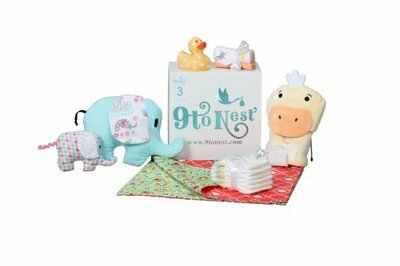 Whether you live in the same town as the new mother to be or across the country, 9toNest is the perfect way to make her feel special throughout her pregnancy. From the packaging, to the little poem included each month, to the darling contents, this monthly gift is first class all the way. My daughter was thrilled to get a gift each month and since I live 5 hours away, it was a fun way to celebrate her pregnancy along with her. I highly recommend 9toNest and plan to utilize the shorter subscription option for a friend's daughter in the near future. 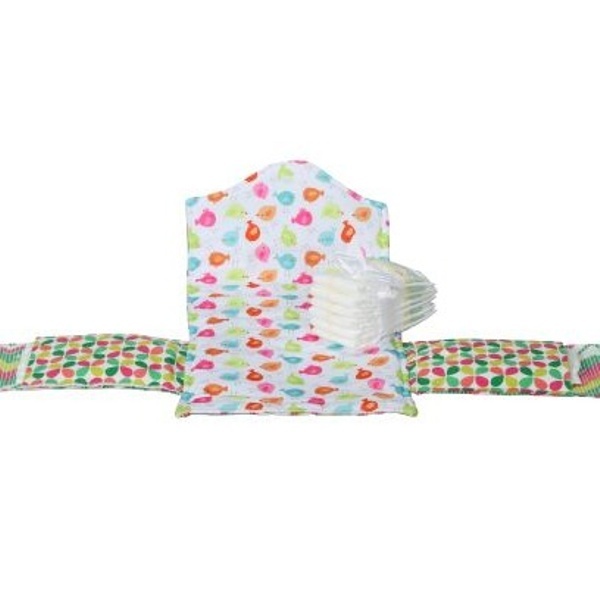 Waterproof diaper clutch with convenient pockets for holding wipes and diapers. This adorable clutch provides a cushy, waterproof pad for baby's comfort. Easily folds to a small clutch. Handmade and machine washable. This 5 piece melamine place setting is sure to be a favorite. 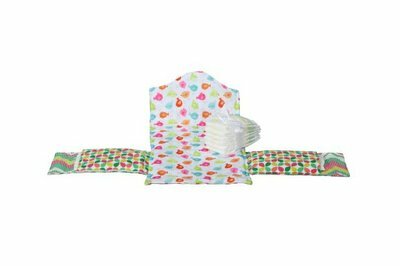 The whimsical farm them is adorable with a super cute absorbent matching bib. 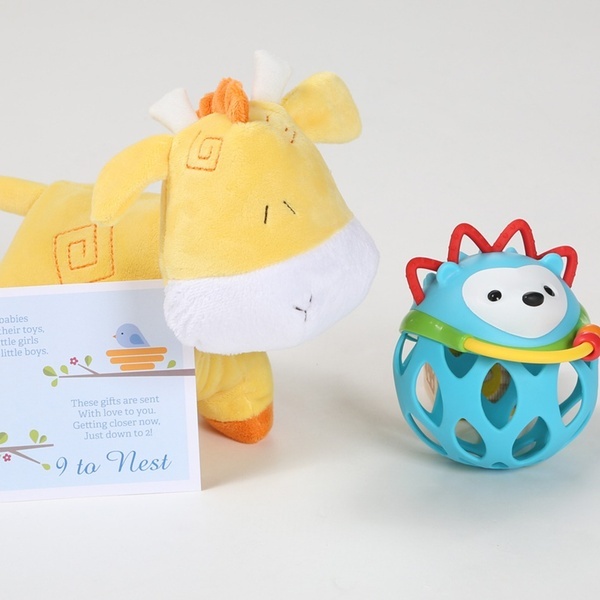 9 to Nest sends hours of fun to baby with darling toys. All are BPA free, PVC free and Phthalate free for your baby's health and safety.